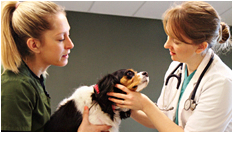 We love the people we serve as much as their pets, while emphasizing comprehensive, high-quality patient care and customer service excellence, and providing our valued employees with meaningful and rewarding careers. We provide a wide range of services including Urgent Care, Preventative Healthcare, Minimally Invasive Diagnostics & Surgery, Dentistry, Soft Tissue Surgery & Orthopedics and State-of-the-Art Imaging. We also offer Resort Quality Stress-free Boarding. 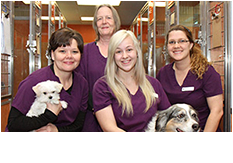 Every person on our staff is a gentle dedicated professional, trained to the highest standards. Only the most caring and compassionate people make our team. Come and see us, you’ll like who you meet.